The London Tenders Portal is the public sector procurement portal for the London boroughs listed in the navigation panel. This portal will support the procurement process and help local authorities and other organisations in the public sector to achieve better value from their buying, whilst providing suppliers with easier access to new business opportunities and contracts. Registering on the London Tenders Portal is FREE for all Suppliers and is a simple and straightforward exercise. Once registered, as a Supplier you will receive email updates on new contract opportunities issued by the public sector that match your capabilities. To register on the London Tenders Portal click on the Suppliers Area. The tender process will be managed electronically via this service, with tenders being exchanged electronically. 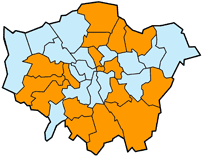 Business opportunities will be advertised here regularly and this area will continue to grow as more London Boroughs register with the London Tenders Portal.